Keyboard player and founding member of Pink Floyd, Richard Wright, died today in Britain after struggling with cancer. He met fellow band members Roger Waters and Nick Mason white attending Regent Street Polytechnic (now The University of Westminster) in 1965 and played on every album except The Final Cut. 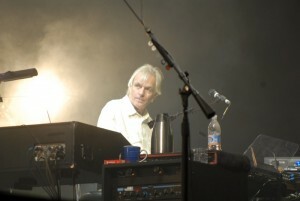 Though dominated by Roger Waters and later, David Gilmour, Wright had a heavy influence on the band’s sound and wrote songs as well. Some of his more recognized compositions, like “Us And Them” from Dark Side of the Moon as well as his early keyboard and synthesizer work introduced the rich synth sound to other bands in the 60s and 70s. A Pink Floyd spokesman says founding member Richard Wright has died. He was 65. Wright died Monday, September 15, 2008 after a battle with cancer at his home in Britain. His family did not want to give more details about his death… He wrote “The Great Gig In The Sky” and “Us And Them” from Pink Floyd’s 1973 “The Dark Side Of The Moon.” He left the group in the early 1980s to form his own band but rejoined Pink Floyd for their 1987 album “A Momentary Lapse of Reason.